SAP users face many challenges. They must respond more rapidly and flexibly to changes in volatile, globalized business environments. They must boost competitiveness and exploit emerging opportunities. At the same time, economic conditions reinforce pressures to cut or at least contain growth in costs. The concepts and technologies of “cloud computing” may play an important role in meeting these challenges. Clouds offer the potential to reduce IT cycle times, more effectively exploit virtualization technologies and increase operational efficiencies. But adoption rates among SAP users have been conservative. 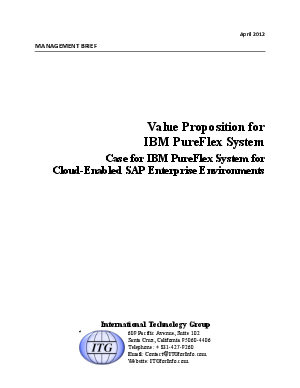 To lean more about the value propostion for IBM PureFlex System download this whitepaper.